Acupuncture treatment for tennis elbow is very effective. We have seen the competitive tennis player with pain so severe that even picking up a fork is difficult. Tennis elbow is a very common condition caused by the repeated twisting of the wrist or forearm. This damage to the tendons can lead to elbow or wrist pain and a weakened grip. While traditional therapies of rest, anti-inflammatories, braces and ice or heat may help in the short-term, they do nothing to prevent the re-occurrence of the condition. 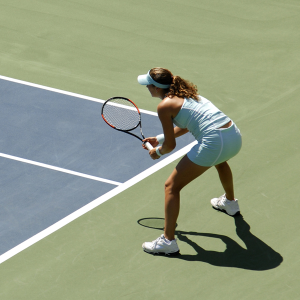 Did you know that nearly 50% of tennis players will suffer from tennis elbow during their time in the game? For a competitive tennis player this can dramatically impact their game and cause a loss in standing. The more causal tennis enthusiast often talks about how the related pain affects their life in more practical ways – especially when young kids or a physically demanding career is involved. Fortunately, acupuncture relieves the inflammation brought on by repetitive use motion and it effectively eliminates the related pain. Recent research by the American Academy of Physical Medicine and Rehabilitation in San Francisco found that acupuncture relieves the symptoms of tennis elbow and appears to resolve the condition completely. At Valley Acupuncture, we have seen the same level of success. Our acupuncture treatments for tennis elbow are approximately 30 minutes long. We focus attention on a localized area and use a very gentle technique so patients have very little sensation when the needle pierces the skin. With as few as 3-4 treatments we find our patients are pain-free for an average of 8 months. And many have not needed treatment for this condition again. Because Traditional Chinese Medicine takes the entire body into account, we simultaneously treat patients for additional and seemingly unrelated symptoms – insomnia, poor digestion, stress, and a variety of other conditions. Each patient walks into Valley Acupuncture with their own set of experiences and individual state of well-being. We take the time needed to fully understand their big picture. This systemic treatment leads to more successful outcomes and patients leave our office feeling relaxed and relieved. The use of improper equipment or technique, a fall on the court, or a strike to the elbow from a tennis ball may cause or exacerbate an issue. Truth is, any time muscles and tendons around a joint are frequently twisted or heavily engaged, a repetitive use/stress injury can occur. While tennis elbow is the most common condition, here in Silicon Valley mouse elbow runs a close second. Additional sports and activities can lead to pain – it all comes down to repetitive use, inflammation and re-injury. With acupuncture we effectively treat the underlying inflammation and see great results in those who golf, ski, garden, knit and more. If you are in pain, please remember to make use of our complementary consultation. Let’s get you feeling better! Valley Acupuncture offers a Complimentary Consultation to newcomers in our San Jose office. Call 408-835-7870 or email us to schedule an appointment.